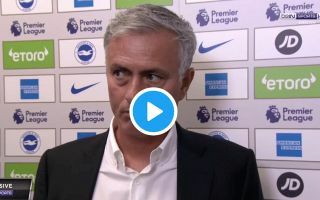 Man Utd boss Jose Mourinho was understandably in a bad mood after his side’s loss to Brighton and it showed in a particular post-match interview. The Red Devils slipped to a 3-2 defeat to Chris Hughton’s men on Sunday, with the Portuguese tactician bemoaning the individual mistakes made by his team which were punished by the hosts. However, when speaking to beIN Sports after the game, as seen in the video below, Mourinho didn’t take too well to a question on the team’s communication and chemistry on the pitch. Clearly unimpressed, he snapped back and told the reporter that she must be “fantastic in your job” to speak about chemistry between the players. In fairness, it was a questionable comment from the reporter as that’s something that can’t really be assessed from the outside looking in at a squad which is together all the time. Nevertheless, the response didn’t have to be so condescending from Mourinho either as he simply could of just responded with a straight-forward answer. However, he couldn’t help himself and naturally the video has since gone viral as it’s further ammunition to question if the Man Utd boss is feeling the pressure.